Being in a nation’s capital during a national holiday is so much fun!!! 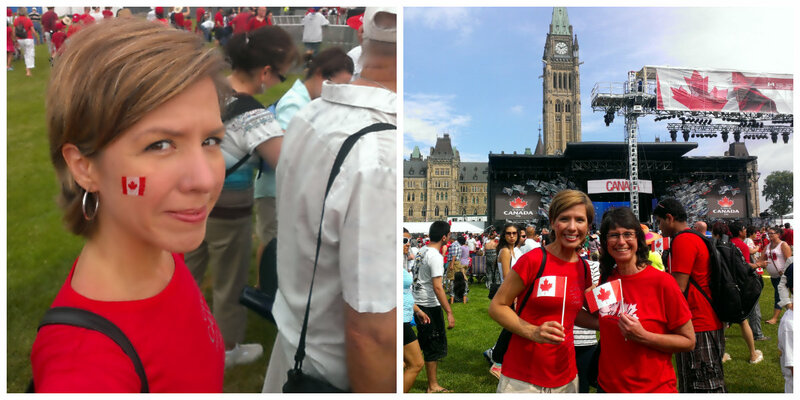 And now that I had been rightly informed that Ottawa is the capital of Canada, I was very excited to be there for the Canada Day festivities a couple of weeks ago! As my Aunt Georgann and I headed to Parliament Hill in the morning, nearly everyone we passed on the street was wearing red and white (including us!). We had plans to stop by Prinzo Cafe Patisserie along the way to pick up another one of their amazingly delicious multi-grain croissants we had had the day before (which I obviously can’t stop talking about), but unfortunately, they were closed. Sadness! Many, if not most, businesses in Canada close for this national holiday. There were not nearly as many people gathered on the lawn in front of the Parliament Building as I was expecting. After a few minutes, the ceremonies started with the official raising of the flag accompanied by bagpipe players. Next was the Changing of the Guard ceremony. This took about thirty minutes. I’m pretty sure that if I were in charge of the marching, inspecting, and pomp and circumstance involved in this endeavor, it would take two minutes flat. 😉 But it’s still interesting to watch, and since I didn’t really get to see this when I was in London I was glad to experience it here. 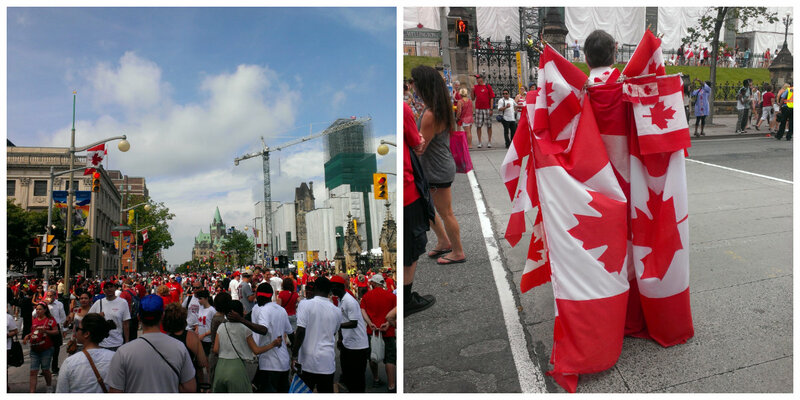 We decided to head next to Major’s Hill Park, and once we exited the gates to Parliament we entered an awesome scene: thousands of people filling the closed-to-traffic streets of downtown, all wearing red and white and sporting maple leaves in various ways. Such a festive, patriotic scene with so much energy! Everywhere there were street performers, vendors out selling anything and everything, and just so many people. It was such a fun atmosphere and this is when I really starting feeling the excitement associated with this special day for Canadians! Inside Major’s Hill Park were many more events being held throughout the day. We headed to the Dynamic Athleticism area to watch The Flying Canucks wow us with their aerial stunts. Yahoo, a street performer from Montreal, warmed the crowd up first by performing juggling and balancing tricks. 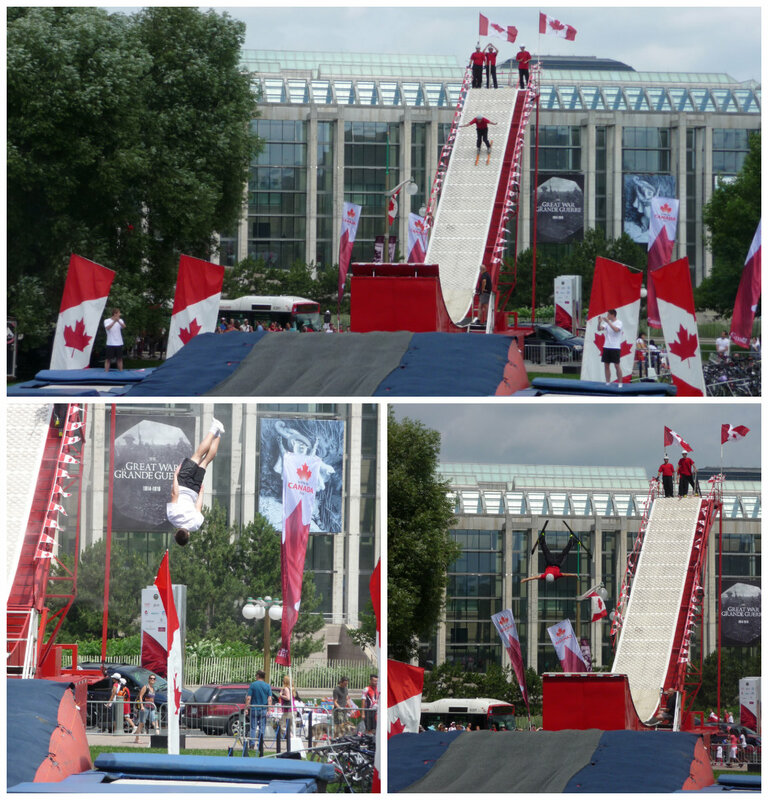 The Flying Canucks are a group of athletes who compete in trampoline and skiing/aerials. Many of them are Olympic athletes and others are World Champions. They perform on two trampolines and one large ski jump. I’ve never seen ski jumping and aerial tricks in person before and certainly not when there’s no snow involved!! It was really cool to see their tricks. We were getting pretty hungry at this point so we checked out the food that was being sold inside the park. I made the unfortunate decision to buy vegetable spring rolls from one vendor and fries from another. A very bad, very greasy decision. I ended up throwing most of it away. Ick. It was still quite warm on this day and we thought it might be wise to get out of the sun for a bit. So we boarded one of the free-for-today buses for a trip across the river to the city of Gatineau, and the Jacques-Cartier Park where more festivities were taking place. I seriously almost fell asleep on the bus! The sun and heat were wearing me out and the A/C and rocking bus was like a sleeping pill for me. The thought actually crossed my mind of just going to the back of the bus, laying across a couple of seats and taking a few rides back and forth across the bridge…but then common sense showed up and told me not to be ridiculous. Such a killjoy. Most of the festivities occurring at this park were geared more towards families and children. But we still walked around and checked everything out. Then it was back on the bus (yes!) for the ride back across the river. 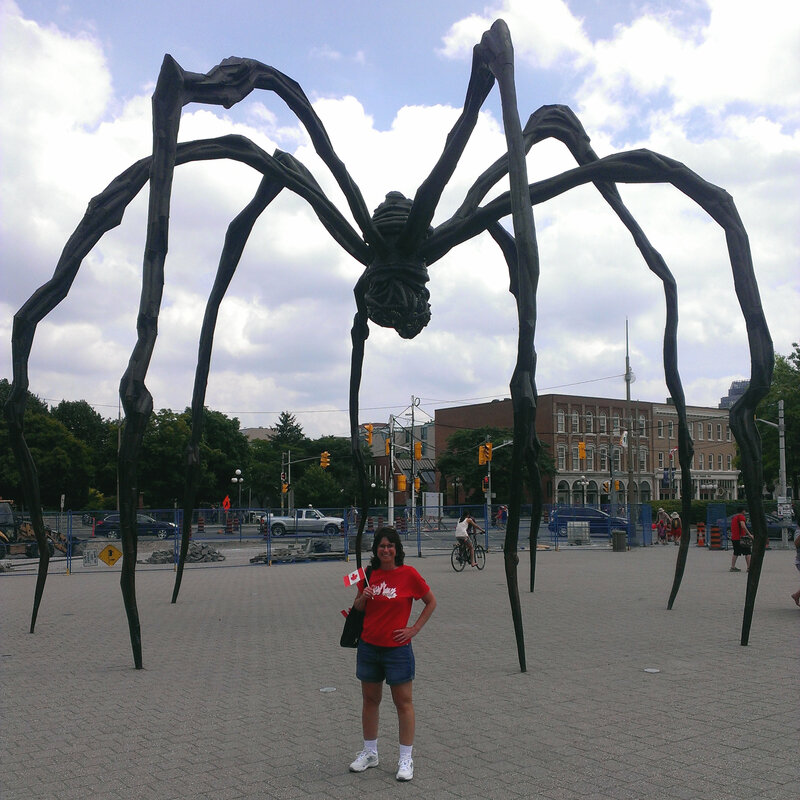 We walked to Ottawa’s famous sculpture, Maman, a giant spider, to take some pictures. Um, a 30-foot high spider? Who in their right mind would want to erect a huge sculpture of a spider?? These are obviously not my favorite creatures. To say the least. I was still feeling sleepy and Georgann was pretty worn out, too, at this point, so we decided to take a break from all the festivities and go back to our apartment to rest for a bit. After our naps (you are never too old to take a nap!) we freshened up then grabbed some dinner at The Royal Oak – an Irish pub with live music. We both enjoyed our food and the music and felt re-energized and ready for the evening’s events! Back at Parliament Hill there were a lot more people than this morning and we joined them in listening to the various concerts being performed by Canadian artists. Although we didn’t know any of the performers, we still enjoyed standing there with the masses and listening to the music. The main event (at least for us 🙂 ) was the fireworks that started at 10:00. This is also when the rain started again (there had apparently been some really bad weather while we were taking our naps). But no one seemed to mind and it only lasted a few minutes. It was so cool standing there as the fireworks started going off behind the parliament building and the national anthem played and everyone (except the two of us) started singing loudly. The fireworks lasted about fifteen minutes and were very enjoyable. The perfect ending to this fun experience that is Canada Day! 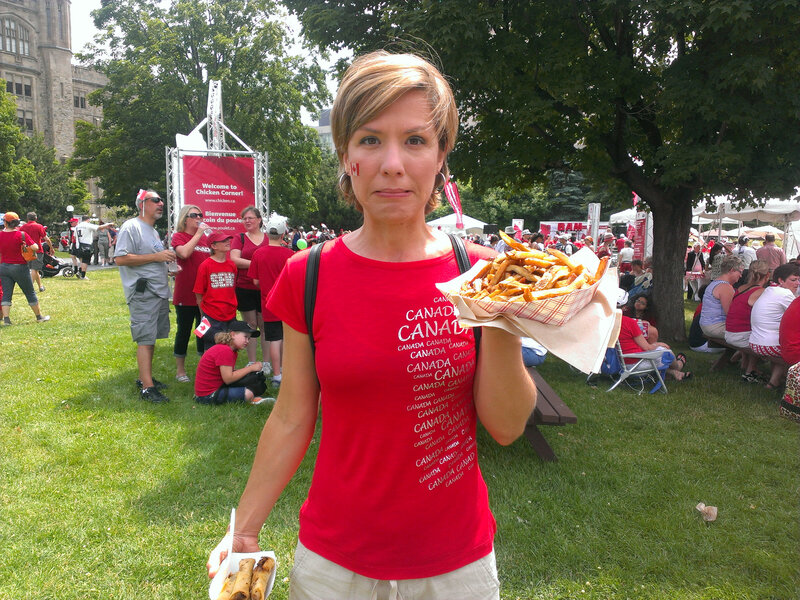 If you are ever fortunate enough to be in Ottawa during Canada Day you’re in for a treat! Yes, there are crowds. Yes, it’s hot. But it’s also a lot of fun and an exciting thing to experience! All of the activities are free and there are over 500 volunteers throughout the city providing information, directions, etc. All of the volunteers we came in contact with were super friendly and helpful. I felt like the atmosphere was very family-friendly and I think they really try to keep things fun and safe and not too crazy. For the evening fireworks, many people, like us, watch from Parliament Hill since that is where the concerts take place right up to the start of the fireworks show. 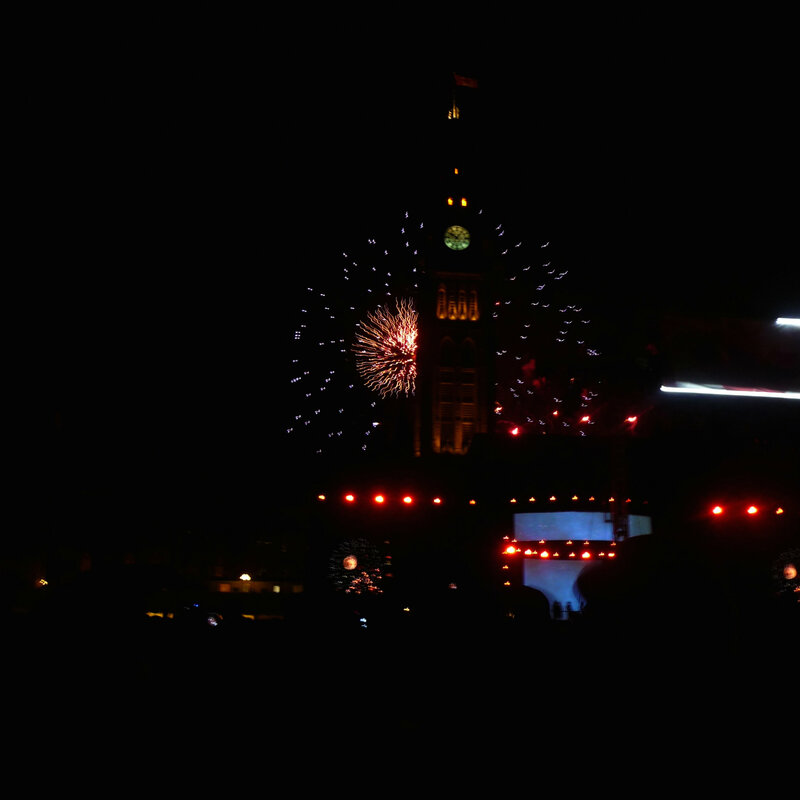 Unfortunately, it’s not the best viewing location as the parliament building blocks much of the fireworks. I’ve heard that an excellent viewing location is Major’s Hill Park, and an even better location is across the river in Gatineau. Keep in mind, though, that the bridge across the river is closed for a few hours before, during and after the fireworks, so if you’re staying in Ottawa, it’s probably best just to remain on that side of the river.